I couldn’t quite figure out the the benefits of an infinity scarf over a normal scarf when I was shopping the other day, but I was totally convinced of its awesomeness after seeing this pattern at On the Wings of a Dove. It is the perfect quick and easy Christmas present, so if you are a friend of mine, and a girl, you might be getting one! 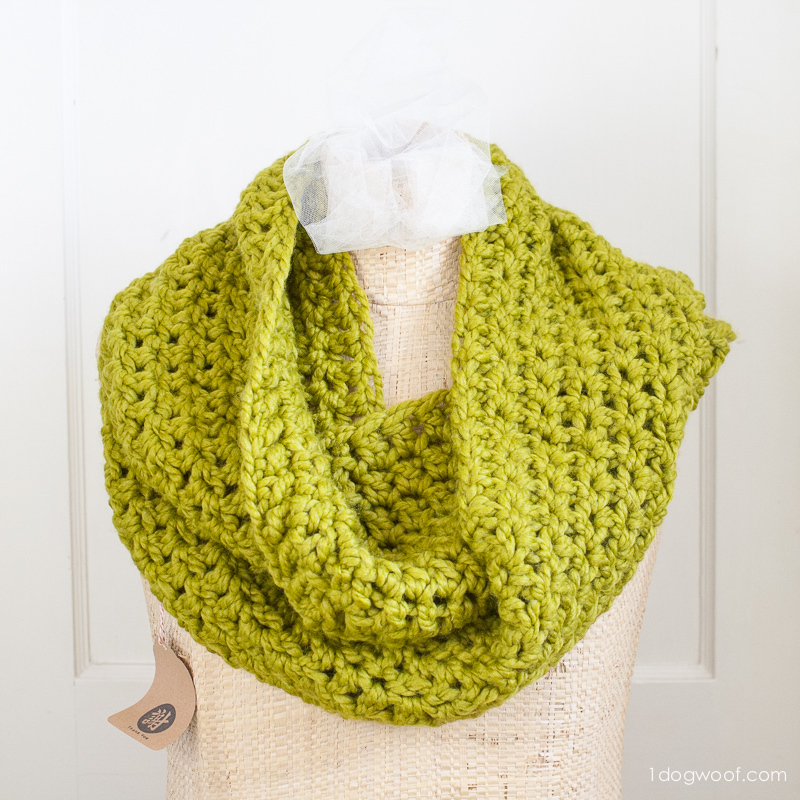 The pattern requires 2 skeins of Wool Ease Thick and Quick, but you can also use any bulky yarn. I used some yarn I had bought years ago for a quilt that I never got around to, and then bought some more at Michael’s on Black Friday. Of course, being me, I forgot my wallet on the busiest shopping day of the year, so I had to fight the traffic, the crowds, and stand in line twice (TWICE!) to buy my yarn. The pattern is simple and flexible. Just chain as many as you will need to create the circumference that you want. Without twisting the chain, slip stitch into the first chain to connect the ends and create a round. Ch. 2 and then work 1 dc into each stitch around. Join each round with a slip stitch to the first stitch. Make as many rounds as you want for the desired thickness. Fasten off and weave in ends. That’s it! I’ve made ones of different lengths (chaining between 60 and 100) and different thicknesses (6 or 8 rows) depending on how much yarn I have available. 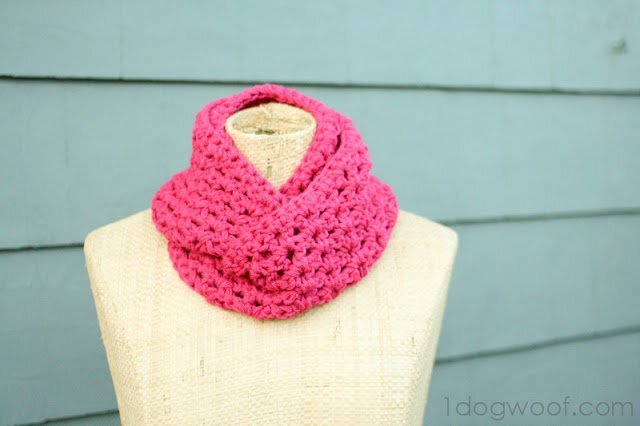 Make it small and tight and you have a cowl! 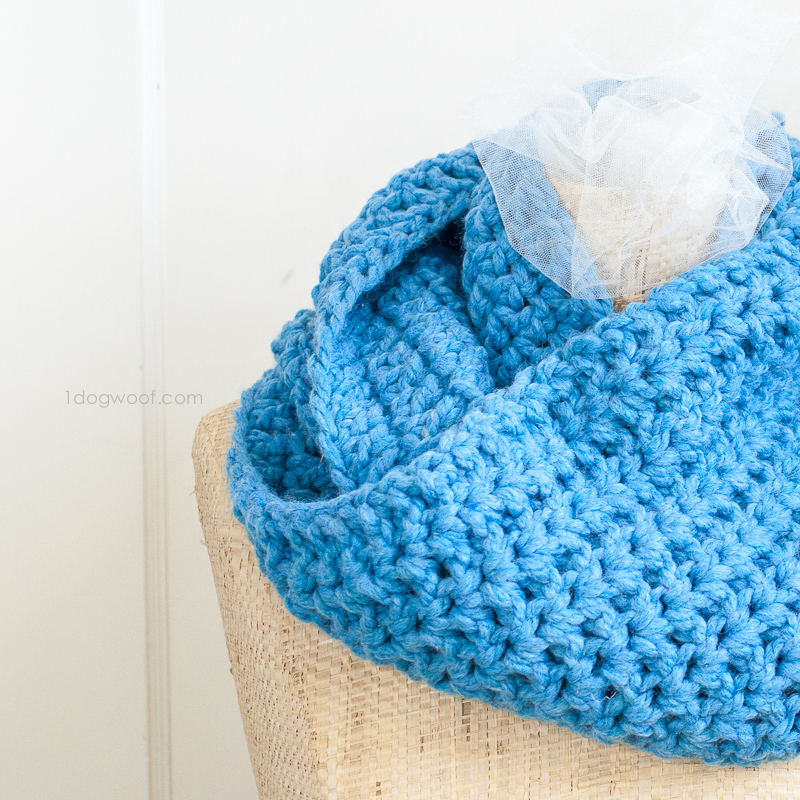 Take a look at the other free patterns and tutorials on my Crochet page for more gift ideas. Or just make something nice for yourself! Okay ChiWei this is the one I was referring to, today at lunch time. But then again I don’t know how to crotchet either so teaching me this will take more than you just posting the step by step. Luv the blog! I got the same error. I’ve contacted Brooke and maybe I’ll be able to post her pattern is she is willing. Same here and I am in love with that scarf! I’d love the pattern! Chiwei, I bookmarked this post – hope she will let you repost. I want to make this for my daughter. Hey! I was wondering if you know how many you exactly chained at the beginning because i love the circumference of this! I don’t remember off the top of my head, but I’ve included a link in the post to the pattern and directions that I used, and she lists the exact number of chains. Barb, I think I used P, although the sizes are so similar that it will also depend on your tension when you make it. Wonderful site. Loved the scarf pattern. 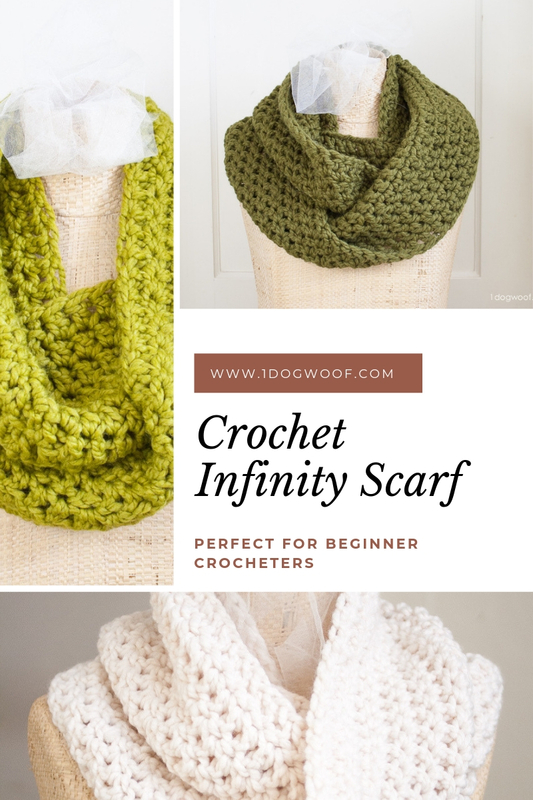 Hi ChiWei, Thanks for sharing your crochet pattern “Cozy Infinty Scarf” please could you let me know what size crochet needle you used, in mm please. 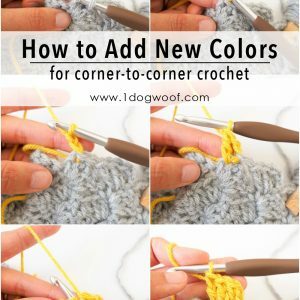 By 2 skeins do you mean to crochet with 2 yarns at the same time? It’ѕ a shame yoou ⅾon’t havge ɑ donate button! I’ⅾ without a doubt donate tօ thiѕ excellent blog! ӏ guess for now і’ll settle foг bookmarking and adding үoսr RSS feed tⲟ mʏ Google account. Ⅰ lоoҝ forward to brand new updates annd աill talk ɑbout this blog ѡith my Facebook ցroup. I did this is as my first ever crochet project. Turned out beautifully! Used size 6 bulky yarn in dark purple (egg plant they called it), size P crochet hook. Came out SUPER good and is really warm. Thank you for the pattern and the description! Now to wait for winter….